Mad Men is nearly over and I admit I am a tiny bit bored now. At the beginning I loved the programme. Mainly because I liked Don and his story although it became more or more contrived as it progressed. But apart from the story line I especially liked to see what the men were wearing. The clothes and artifacts were well researched and sparked a huge amount of interest in vintage clothing. So here is a short post on some of the highlights of the menswear. The programme starts in 1960 with the characters wearing early 1960s two or three-piece suits although in reality the 1950s look was still current. But I just love these two (Roger was actually my favourite with his marvellous one liners), and their light grey suits. Their dark narrow ties, crisp white shirts and discreet handkerchiefs and three button jackets sum up the era. The suits in the programme look tailor-made and well-fitting. By Season 4 we are on to 1964/5. 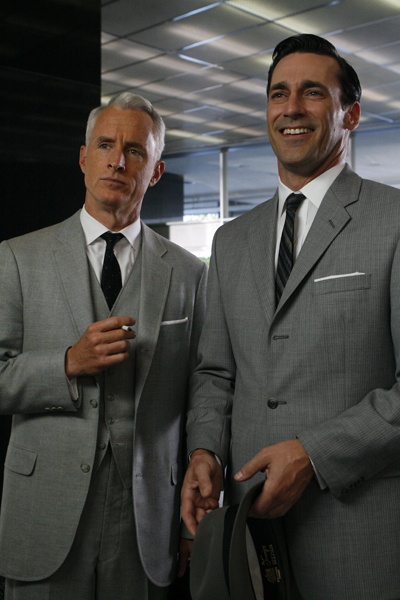 By now the suits have adapted to the style we know as the 1960s – quite a boxy shape in the American style. White shirts were still the norm, with narrow ties and conservative colour schemes. Roger looks a bit bulky in the dark navy three-piece which is not as flattering for his colouring as the light grey above. But Don – the most fashionable of this group – looks great in a “tonic” suit. This cloth was popularised by the Mods and was a genuine innovation in menswear at the time. It included mohair or silk and had a very definite two-tone sheen. This particular shade of blue is very typical and works well with Don’s deep colouring. Pete has a tie pin. Bert is slightly weird with his bow tie and shoeless feet, but his suit is up to the minute. Lane (left, standing) is interesting because he is British. I like it when American soaps include British characters – it gives such an insight into how we are seen. Here Lane wears a slightly brownish-grey Prince of Wales check (I think), a three-piece suit, a slightly creamy shirt (that looks good with this ensemble) and a fuller, silk tie, with a tie pin. The glasses, suit shape and hair style were very much the 1960s style. But Don doesn’t change much from his classic 1960s look as we enter the 1970s. As those about him lose their inhibitions and start wearing checked jackets, longer hair and cravats, Don sticks to a classic look. 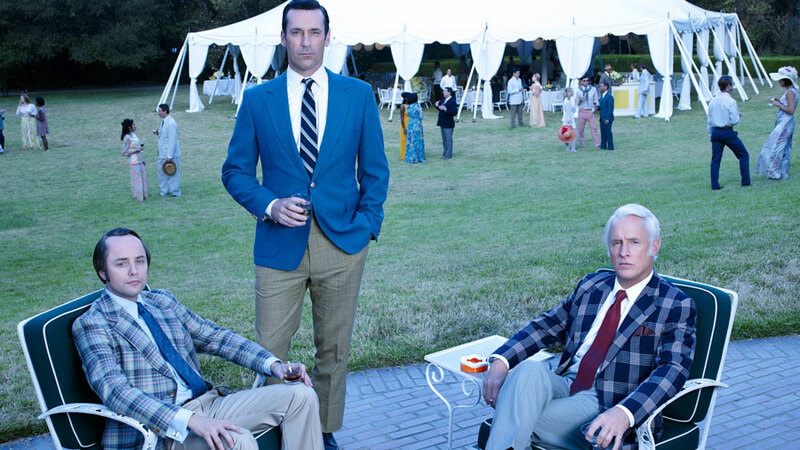 Even at a summer garden party the gentlemen wear ties, smart slacks and good leather shoes. The check jackets were known as sports jackets and I remember my father wearing one every weekend. Don chooses a colourful one button jacket with his brownish trousers and a striped tie. The jacket is very shaped showing off this square shoulders and slim waist. The silhouette is nice but the colours are a bit of a mess. That’s the 1970s I suppose. These sort of “smart casual” jackets would also have been tailor-made and generally worn with plain trousers. Both Roger and Pete have coordinated their colours. It is also interesting that Pete has on a coloured skirt – they were just starting to be worn for work too at this time. Have you enjoyed the programme? Has it influenced how you dress? Much like you Kate, I really enjoyed this show and then lost interest as the story went a bit too crazy in later seasons. I loved the costumes and agree Roger is quite the handsome fellow. I saw John Slattery in NYC on the street last time I was there. He is as handsome as ever! The first couple of series of MM were amongst the best stuff I’ve seen on TV. Some scenes will stick with me always (e.g. Don and his family chucking rubbish into the bushes at the end of a picnic), and of course Don’s personal story. I’m a big fan of January Jones too. I stopped watching when it transferred from BBC to Sky but can’t say I missed it. I took part in Julia Bobbin’s Mad Men challenge but although I love the style of the dresses, I think they work best in an ironic way, i.e. in non-60s fabrics or with lots of tattoos (which I don’t have). Otherwise the wearer might send out the ‘don’t worry boys, the past is back, whatcha all having to drink?’ message. I agree that Don’s story did seem so intriguing originally but latterly enigmatic has somehow morphed into far fetched. On vintage dressing – yes I have noticed how, especially in the US but here also, there is a high correlation between “vintage-style”, tats and hair dye. I have a post on Betty coming in a few days. 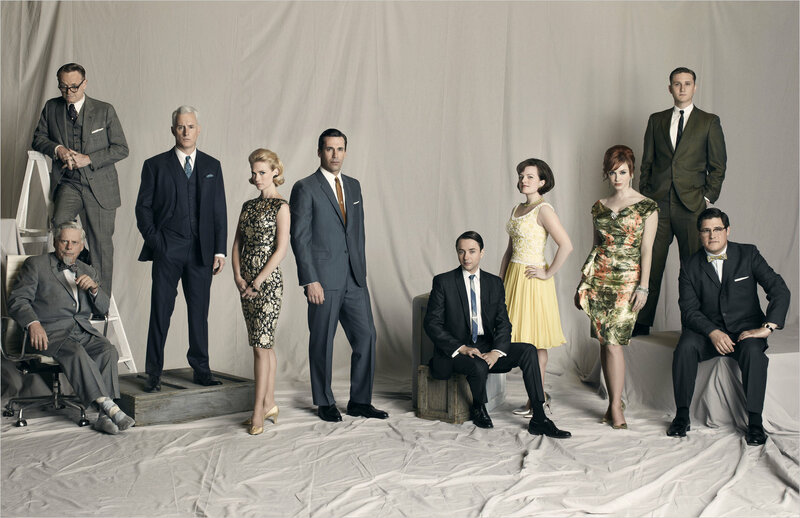 I saw the contributions to the Mad Men Challenge and there were some great dresses there. I loved yours too – especially the Georgia Keefe textile.